Everything Beauty and Beyond! 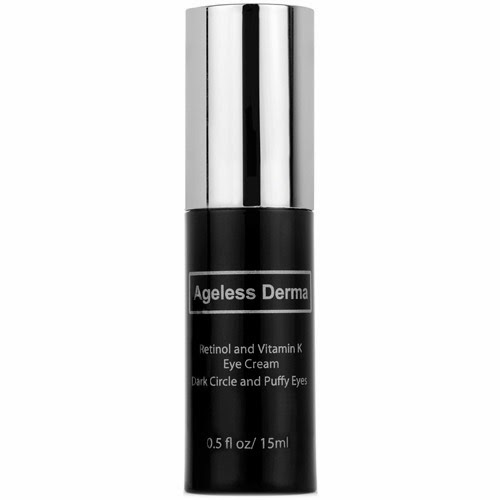 : Ageless Derma Retinol and Vitamin K Eye Cream! Ageless Derma Retinol and Vitamin K Eye Cream! Some people believe that the eyes are the windows to the soul. If that be true, its best then that you take care of your eyes so that it doesn't seem like curtains are falling upon them. One of the most neglected area are the eyes. The older we get, the first signs of aging and wrinkles for many appear here. One day while surfing the net for a good retinol eye cream, I read that retinol mixed with vitamin K produces great results for the eye area. Furthermore, I came upon a published study that was done in the Nippon Medical School in Tokyo that showed out of the 57 participants that were recruited for the study, after 8 weeks of using a certain eye cream twice a day; 81% of participants claimed that they had a visible difference to the bruises, wrinkles, dark under eye circles and puffiness around their eyes. While doing my research, I came across a company called Ageless Derma that was offering an eye cream that not only had retinol (0.1%) but also peptides and vitamins C, E and K (2%). Prior to finding this company, I had read when using an eye cream with retinol, one should also use vitamin K to help moisturize the eye plus it helps with bruising and swelling (dark under eye circles). This eye cream has the essentials for the eyes to combat against wrinkles. And while we know nothing can stop you from aging (don't buy that hype), however it can help you by looking good in diminishing the look of wrinkles as you get older. What I liked about this eye cream so much was that first, it was produced based on a real study that was performed and published. Second, the company has also added in vitamin C and E plus peptides to enhances its effect on the eyes. Also, they nailed it with putting the formula in an air tight pump bottle. What a lot of companies fail to see is that when you put retinol or antioxidants in a jar or open containers, they will become ineffective very quickly (if not by the time you take it home from the store) because all these antioxidants oxidize themselves when exposed to light and air. Hence why these products should come in an air tight dark or opaque pump when you buy them. Retinol, (which is the purest form of Vitamin A) helps the skin to regenerate itself from deep within by building and resorting collagen. It improves the cellular function of skin that is aged and photo-damaged due to UV exposure. With Vitamin K, studies founded in the American Academy of Dermatology in 2003 that applying vitamin K to the eyes, works to reduce dark under eye circles. So you might be asking now, "what is all this extra stuff in the bottle about?" Well, lets break it down. Peptides help to produce and stimulate collagen to help with wrinkles. Vitamin E is an antioxidant that repairs skin damaged from free radicals cell damage that in many cases are caused by UV rays from sun exposure! Vitamin C is a powerful antioxidant that helps fights free radicals damage. Moreover, Ageless Derma justifies these extra added ingredients according to clinical studies reported in the Journal of Cosmetic Dermatology. It stated that creams that contain Vitamin K, retinol, Vitamins C and E placed on the eye area were effective for those who suffer from dark circles and wrinkles. Because this cream is formulated properly, I did not having any dryness, peeling or redness. My eyes never stung, felt sensitive or burned. Now I will admit, the product says to use it 2-3 times a week at night. However at my old age of 33 I tend to sometimes not read things properly and I was using it every night. Nonetheless I had no adverse side effects at all. The cream comes out in a yellow color and literally half a pump does both my eyes. A full pump was a waste of cream for me and trust me I have big eyes! However, if you plan to use this product, there are somethings you need to know. 1. Only use this product at NIGHT! Since this product contains retinol, exposing it to sunlight renders it ineffective. So only put it on at night right before going to bed. If you want further information about retinol and how to properly use it, then click here. 2. YOU MUST USE SUNSCREEN!! When going out during the day regardless of the weather always wear it! Even though this product is for the eyes, not using sunscreen and exposing yourself to the sun will cause your skin to burn. Furthermore you will damage your skin and render the cream ineffective. Don't be crazy here, and pay attention to this. Make sure to get sunscreen that has Broad Spectrum Protection UVB/UVA SPF 30 and up. If you want to learn more about how not using sunscreen damages your skin, then click here and then click above (in case you haven't) about how to properly use retinol. 3. Since this product also uses vitamin C you still need to use sunscreen. Though vitamin C is excellent to defend against free radical cell damage, nonetheless it goes hand in hand with sunscreen in order to work properly. If you want to learn more about how vitamin C works and its great advantages, then click here. 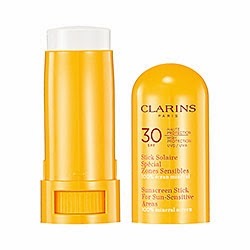 Since applying sunscreen around the eyes one must be careful to not irritate the eyes, I would recommend buying Clarins Sunscreen Stick For Sun-Sensitive Areas SPF 30 High Protection UVB/UVA. This stick is great to glide right over your whole eye area including the eye lids, inner corner and underneath the eyes in order to protect them from the sun while you use Ageless Derma Retinol and Vit K Eye Cream. Part of making sure a product works is making sure you are not doing something else to render it ineffective. So if you are going to buy this product, then make sure you buy some form of sunscreen that is safe around the eyes that offers you Broad Spectrum Protection UVB/UVA SPF 30 and up. Ageless Derma Retinol and Vitamin K Eye Cream is a for sure winner for me and I plan to continue using it!